Gitxsan woman, Francis Jackson is an award-winning cedar bark weaver. Authentic Gitxsan handmade cedar weaving art and products, by Frances Jackson, a fluent Gitxsan speaker, from the Killerwhale/Fireweed or Gisgaast Clan, from the House of Simoiigyet Chief Woosimlaxha (brother). She grew up in the community of 'Ksan, in the Upper Skeena River Valley and travelled with her family to the North Pacific Cannery to work during the summer fishing season. From her mother and her aunts, Frances learned the traditional skills of Gitxsan women, including weaving and today with her sister, she harvests cedar bark in the local forests. 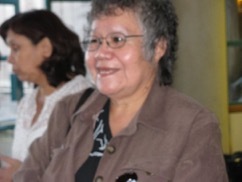 An accomplished weaver, Frances has won recognition and an international award for her basketry. As her weaving evolved, Frances began to move from conventional pieces like cedar bark hats and baskets, to christmas ornaments, medicine bags, and even graduation caps. Even though many hours go into the creations of each piece, her quality of work is modestly priced. You can find pieces in the gift shops and at North Pacific historic Fishing Village National Historic Site. It is not only the skill of the weaver that determines the quality of a hand woven piece, but also the quality of the materials used to create the piece. Cedar bark cannot be purchased commercially. It is harvested manually, only in the early spring when the sap begins to run in the tree. it is then soaked and separated into strips of the right thickness and consistencey. the meticulous work is time consuming and requires patience and skill. Click to view Francis' cedar weaving.